Cherokee County, Alabama Historical Boundaries showing changes over the years. Growing up there on the Alabama-Georgia line, I always listened for people to say "Georgia time" or "Alabama time" after they made an appointment. I guess that has been going on every since time was standardized and the time zone edge was placed on the state line. Before that, well, who cared what the clock said? You had to milk the cow when she started mooing; and you had to plow while it was light. 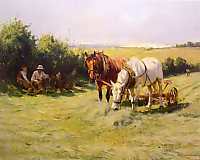 Everybody knew that, because nearly everybody was a farmer in the nineteenth century. You can see line after line of that vocation in the Cherokee County censuses. My father was so drawn to the soil that after he got married and got a paying job, he gave it up to go back into farming. Sharecropping, 50-50. After he failed, my family, which had been farming for tens of generations I suppose, no longer farmed. We couldn't get away from it right away—I picked cotton as a teenager, and the schools insisted that I buy a coop of chickens or a cow and become a Future Farmer of America. That was the farthest thing from my mind. It was the early 50's at what was called Cedar Bluff High School, though it had 12 grades. I was a 5th-grader there after Dad found employment again. I remember the school had outhouses—wide smelly ones—one for the boys and one for the girls. There was an ancient indoor toilet for the faculty. In high school, I learned that fees were charged to students. Books had to be bought by students, by the sweat of their or their parents' brow. There was no band, no science lab—why, they barely had money for FOOTBALL!! I was allowed in 1958 to help in the school office. I would handwrite weekly paychecks to teachers, among other things. Teachers' salaries were a paltry $60 per week, to my recollection, with the senior teachers getting $70. The school principal lived beside my family in a slightly better house —and we were poor. So you think Alabama's funding for education is bad in the year 2000? At mid-century, there could be no doubt that teachers were devoted to education. Once in 1932 and again in 1956, the Alabama Legislature went on record as saying public education was not a service the state had an obligation to pay for. Three decades earlier, funding was even lower, and students at many schools were required to go out into the surrounding woods and gather firewood to heat themselves at their school's lone stove. A memoir by a distant relative, Donald W. Hardin, tells of moving from Fairfield to Ohatchee, Alabama in 1927 to a "no-outhouse" school. He says, "The status of a boy in the school was dependent upon the type of wood he could chop and bring in." During the depression, teachers were likely not paid, were paid with IOU's, or with "script" worth ten cents on the dollar. There is a picture in the Cherokee County Heritage Book, vol. 1, showing Cedar Bluff High School in 1921 as a two-story frame set on stone pillars, and having three windows showing in each floor and a bell tower. It looks like a class act for its time. Jamie Ray of Cedar Bluff, who wrote the piece "Cedar Bluff High School" in the Heritage Book, says a one-room school existed before a new building was opened in 1923. The two-story school certainly had more than one room, so there is a discrepancy of a few years I would like to resolve in my head, if some reader has more information. Getting back to mid-century, in fifth grade my teacher was the venerable Mrs. Hazel Mobbs. She lived a long time after the fifties, and an eternity before the fifties—she taught my father at the same school in the 30's. Earlier teachers had taught his father, and this had reached back into the mist of one earlier generation—or would have, if great-grandpa G. W. had had the time to attend school there at Farill. Great-grandpa G. W. was, I believe, illiterate. His widowed mother Mary absolutely depended on him and the other boys to farm for income. I was surprised to learn that many of my people have been in Cherokee County for a long time. John Hardin arrived in the county between 1833 and 1835, with others soon following. His arrival just preceded the driving out of the Cherokee Indians, which happened in 1836 as I recall. Other ancestor names are Raines, Barkley, Story, and Isbel on my father's side; and White, Lane, Martin, and Johnson on my mother's. All were farmers. The Hardins of my line lived at Bluffton (before it existed), then Coosa, Georgia, then finally settled in Farill (a community in Alabama between Cedar Bluff and Rome) about 1875. In the 1940's they dispersed to Etowah County as far as Southside, with some staying in Cedar Bluff. John Richard Story's father was Samuel Story, who came to Farill about 1876 after losing his wife Lovie to a fever in Worth County, Georgia. He had about nine children, most of whom helped populate Cherokee and Floyd Counties. Sam Story remarried, to Eliza J. Ingram of Farill, when he was 61 years of age. Sam Story had been born in Houston County, Georgia, and had served the Confederacy in the Civil War in that area's Company G of the 64th Georgia Volunteer Infantry Regiment. Sam's father was born in Warren County, Georgia. Burrus Martin came to Cherokee County in the mid 1800's. Thomas Marion Johnson (1828-1896) was born in Alabama and died in Etowah County. The Whites and Lanes on my mother's side have a more colorful history. James White was born in Rome between 1862 and 1865. He was the adopted son of William White, probably of Dalton, Georgia. William White married Mary Adams, who lived in Cave Spring in 1870 with her son James and his older sister Josephine. From 1860 Mary Adams was the faithful servant of Josephine Bale who married Burwell Harbour that year and established a plantation at Cave Spring. More specifically, the plantation was near State Line Church on Blacks Bluff Road within a mile of the Cherokee County, Alabama line. Mary Adams was a mulatto slave who was given to Josephine Bale Harbour by her father John Bale. While at the John Bale household Mary almost certainly would have known Uncle Jerry Akin. Mary passed on the name Fasue. Possibly it was her mother's African name. Possibly it was her own name at one time. My mother did not tell me which one was Fasue, but she thought it to be "the one who crossed the ocean." The whereabouts of Mary White after 1880 is unknown to me. Much later, about 1923, Mary's only son James White and his wife Miranda Vassie Martin, with three of their children, left Hokes Bluff to resettle in Tulare County, California, while my White ancestors stayed in Cherokee and Etowah counties. My dear maternal grandmother was Lovia Lane. Her father, William Macon Lane, came to Hokes Bluff from a large family in Piedmont, Alabama. A festive ocassion at Cedar Bluff Baptist Church about 1956. Click photo for more detail (211 KB).